Burmester introduces C500 concept speaker with rotating woofers | What Hi-Fi? 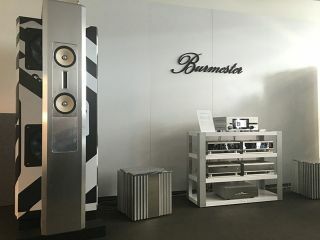 Luxury audio manufacturer Burmester has used the High End show in Munich to unveil what can only be described as “high-end” speakers in the form of the C500. While still at the concept stage, the C500 speakers take their name from their weight - each speaker weighs 500kg. Sound is fired through two midrange drivers, with stiff cones and a powerful magnet system, and four Air Motion Transformers - plus two rotating 15in woofers on the side. The treble and midrange drivers are embedded into the aluminium faceplate on the front of the speaker, which stands at nearly two metres tall, while the woofers are mounted in a separate rotating body (the black and white part behind the main speaker in the images above and below). The rotatable body allows the C500s to perform a party trick as they can used in two different modes. The first, ‘Pure Mode’, is for the “audiophile listener” and is optimised for a seated position. The front-facing drivers are moved into a central position on the faceplate to help project sound to your ears, while only one of the side-firing woofers is activated to help minimise ceiling reflections and unwanted frequencies. The second option, called ‘Live Mode’, sees the speakers go through a transformation. The front drivers are moved up and the woofer assembly rotates 90 degrees to face forward. When in this mode, both 15in woofers are used to enhance the bass, and a tweeter at the rear helps to add some three-dimensionality to the sound. The result is genuine room-shattering, but controlled, bass. We were fortunate enough to get a demo of the speakers in Munich and our ears are still recovering. There’s no word on if and when the C500 speakers will be released or indeed how much they are likely to cost. Don’t expect them to come cheap though. Burmester unveiled the C500 speakers alongside its new 159 Mono Power Amplifier, two of which were used to power the speakers. The 159 is the first dedicated monobloc from the company since the 1980s and, as such, features the latest “state-of-the-art technology” and is said to be the firm’s most powerful amplifier to date. All of the internal sound components were designed by Burmester but have been produced by other German manufacturers, while the circuitry has all been thermally optimised, which Burmester says allows the 159 to reach its optimal temperature in roughly 20 minutes. It’s also claimed the 159 has a higher bandwidth than the 909 power amplifier, which should result in fewer phase errors. Pricing and availability for the 159 Mono Power Amplifier have yet to be announced.